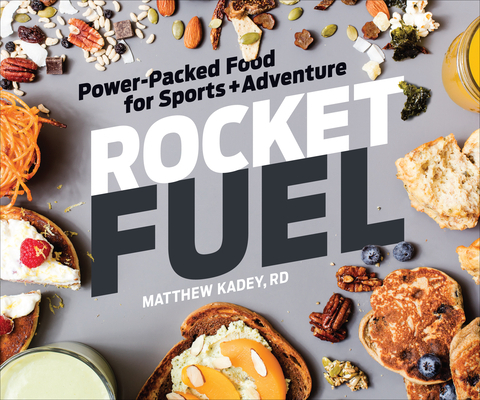 Kadey's ingenious Rocket Fuel foods--like easy-to-make muffins, bars, pies, bites, gels, smoothies, balls, wraps, and cookies--will inspire how you fuel for your favorite sports. Since studies show that real food works just as well as processed sports food products, you'll enjoy a huge variety of flavors and a healthier, more nutritious performance fuel that's free of artificial stuff and high price tags. Kadey's DIY performance foods include dozens of new flavors and innovative forms that ensure you'll always look forward to your next exercise snack. Matthew Kadey is a James Beard Award-winning food journalist and a registered dietitian. He is a recipe developer and nutrition writer for top health/fitness magazines and has written for Bicycling, Canadian Cycling, Canadian Running, Competitor, Delicious Living, Eating Well, Experience Life, Men's Health, Men's Journal, Prevention, Runner's World, Shape, Trail Runner, Triathlete, WebMD, Women's Health, Women's Running, and Yoga Journal. Kadey won the James Beard Award in 2013 for Food Journalism. He holds a masters degree in sports nutrition and is the author of Muffin Tin Chef and The No-Cook, No-Bake Cookbook. He lives in Ontario, Canada.